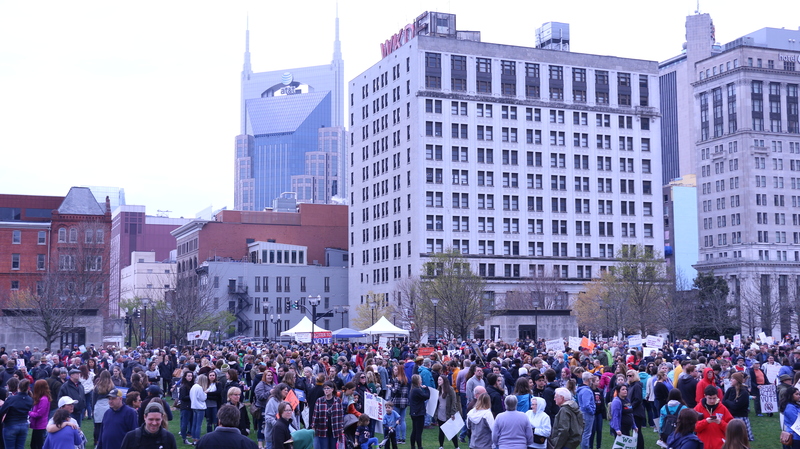 Thousands of demonstrators protested for gun control and increased firearm regulations on the Nashville Public Square Saturday as a part of the national “March for Our Lives” movement. 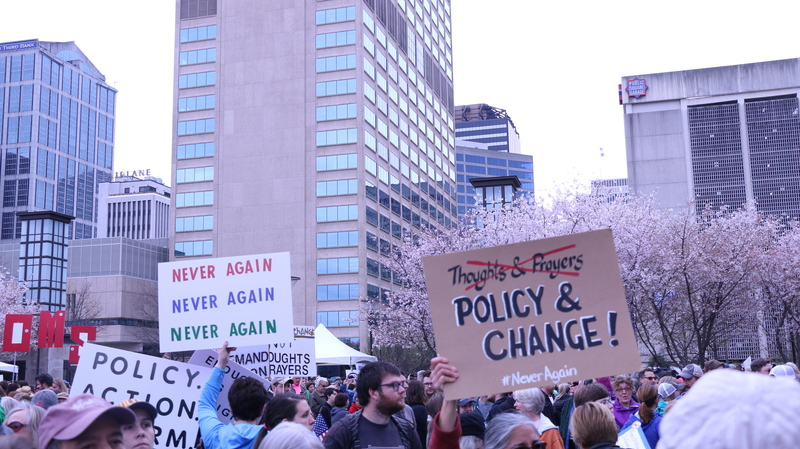 The movement began in response to the mass shooting at Marjory Stoneman Douglas High School in Parkland, Florida, on Feb. 14, in which 19-year-old Nikolas Cruz brought an AR-15 assault weapon to the school and killed 17 people. 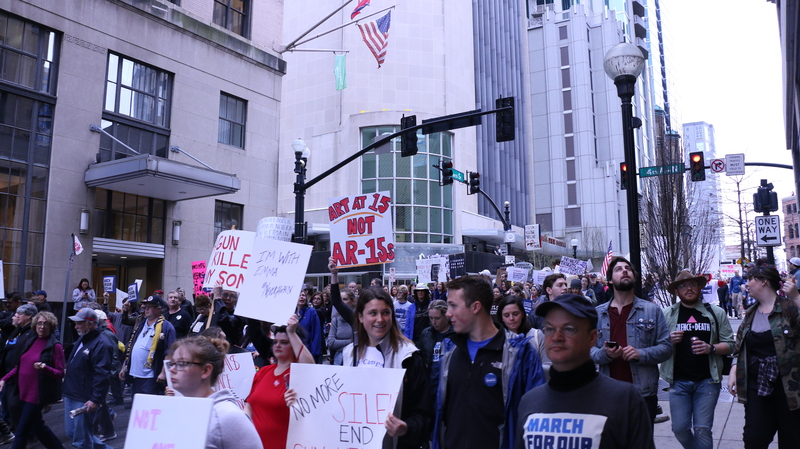 The March for Our Lives Nashville event was organized by Abby Brafman, a freshman at Vanderbilt University and a 2017 graduate of Marjory Stoneman Douglas High School. She spoke to demonstrators before the march commenced. Brafman explained that, because she continues to come home from school every day, she is a survivor. She said that she realized this upon hearing news of the shooting at her old high school. Brafman then took a moment to address the many children attending the march. She encouraged them to let their voices be heard. After her speech, Brafman gave the podium to Nashville Mayor David Briley. 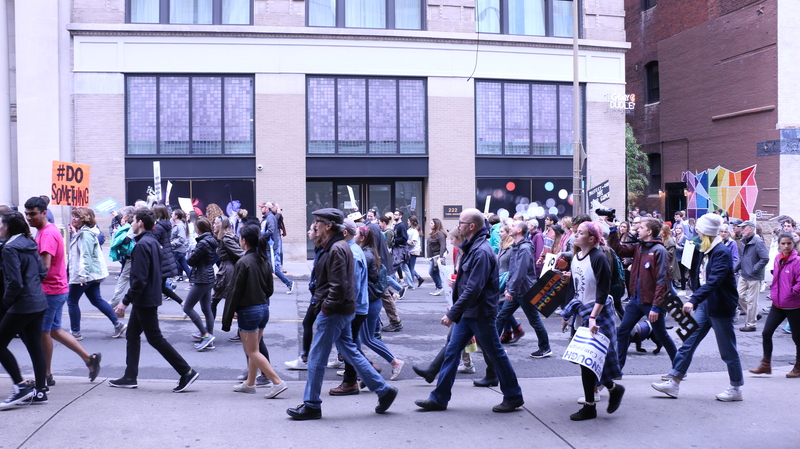 He referenced the early protests for desegregation in Nashville that took place on the same public square. 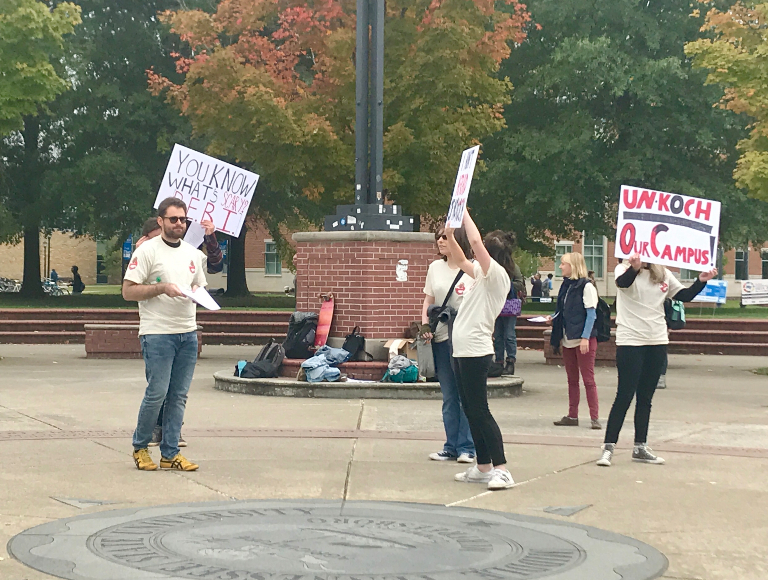 Briley asked what the crowd was going to do about it, and they shouted back, “Vote.” Briley encouraged members of the audience that were not already registered to vote to register at a booth at the event. 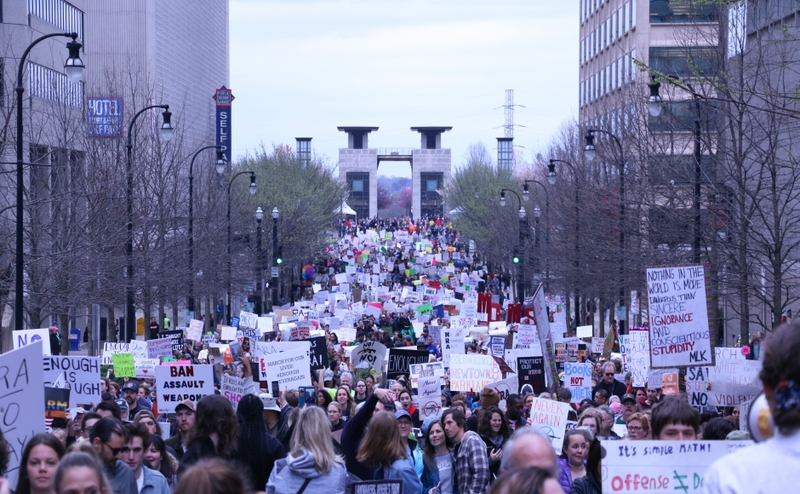 Bishop Marcus Campbell, the pastor of Mount Carmel Baptist Church in Nashville, was the last speaker before the march started. 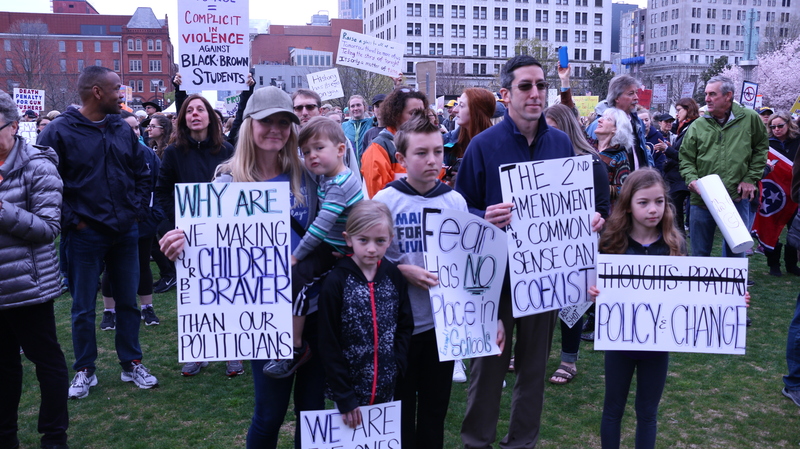 Campbell explained that kids in high school today have to worry about “being safe, being able to fit in and not being talked about.” He also made a point that the rally was about all gun violence, not just high school-related violence. Campbell expressed hope for change. 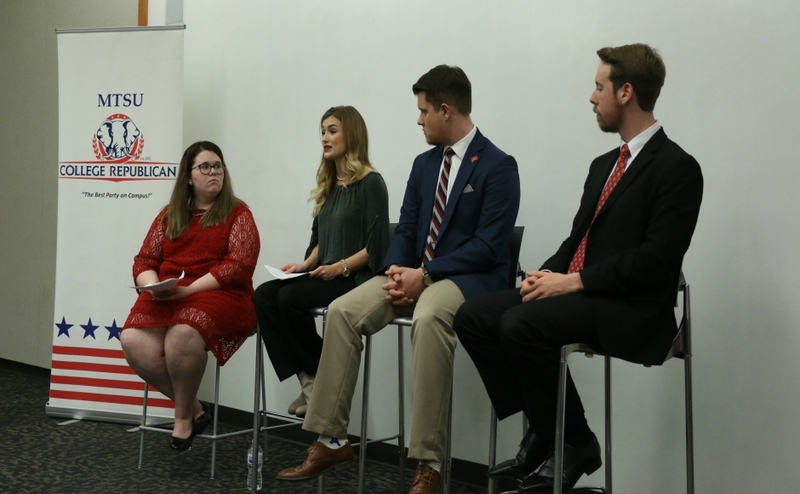 Bugg talked about some potential solutions he would like to see for gun legislation. Bugg had a message for the young people who were demonstrating. “Never give up, share the love and try to vote intelligently,” Bugg said. 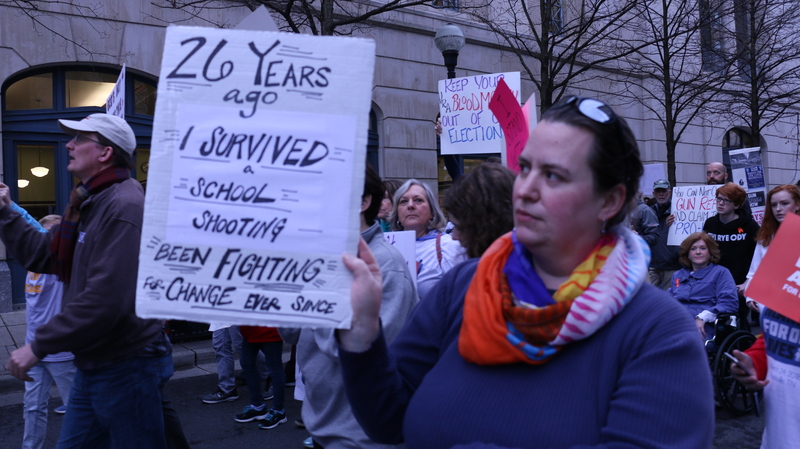 Another demonstrator, Libby Glover, carried a sign that read, “26 years ago, I survived a school shooting. Been fighting for change ever since.” Glover attended Bard’s College at Simon’s Rock in Western Massachusetts. In 1992, there was a shooting on her campus. 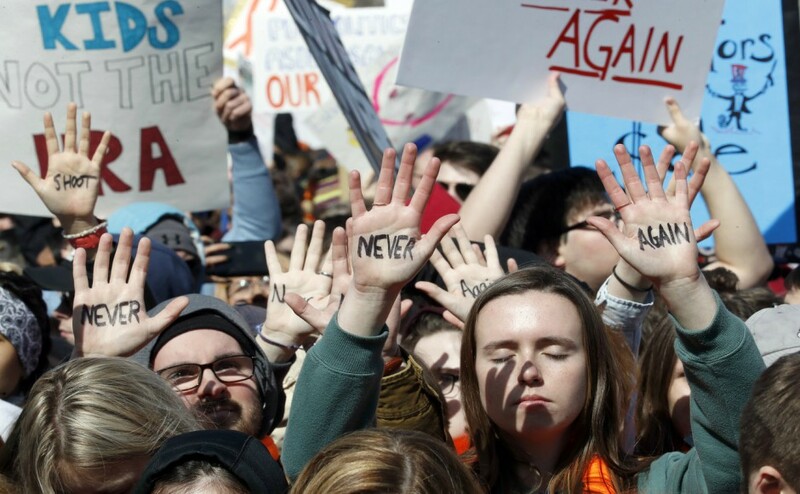 Glover related her experience of being an activist back then to Saturday’s March for Our Lives event. The other side of Glover’s sign read, “They give me hope,” referring to the Parkland students. Also attending the event was Alex Soffer, a teacher from Brooklyn, New York. She was in Tennessee visiting with family when she decided to attend the event. Soffer explained the importance of having a voice and enacting change. 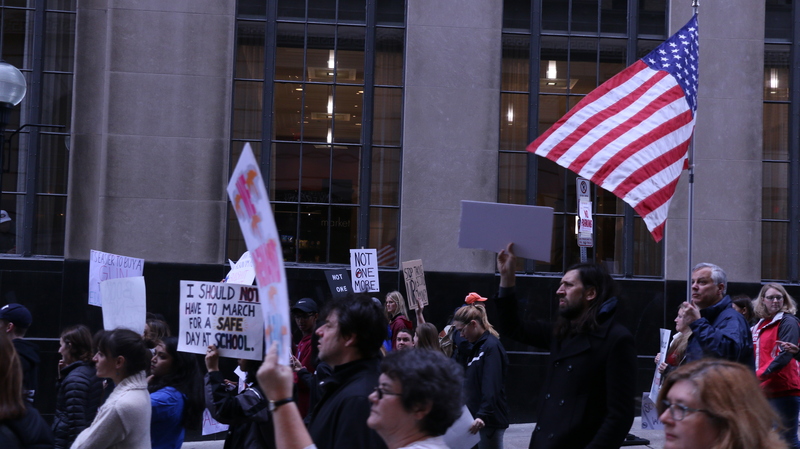 “We need to instill in our children that the only way to make a change is to continue to have a voice,” Soffer said. 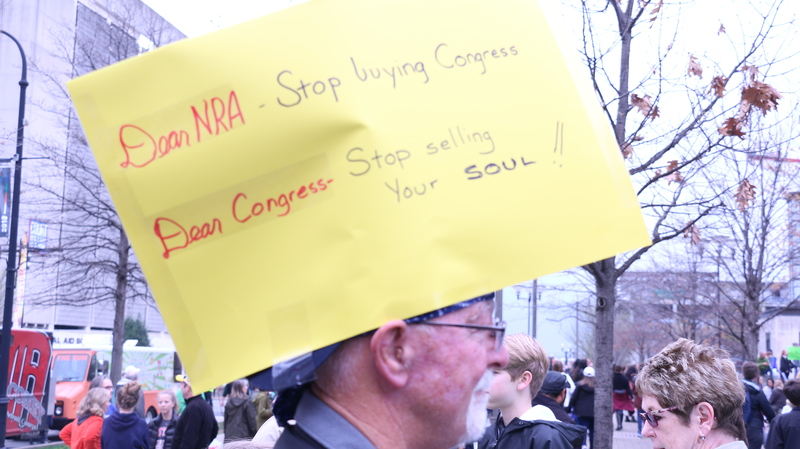 Soffer expressed hope for a change in gun control. 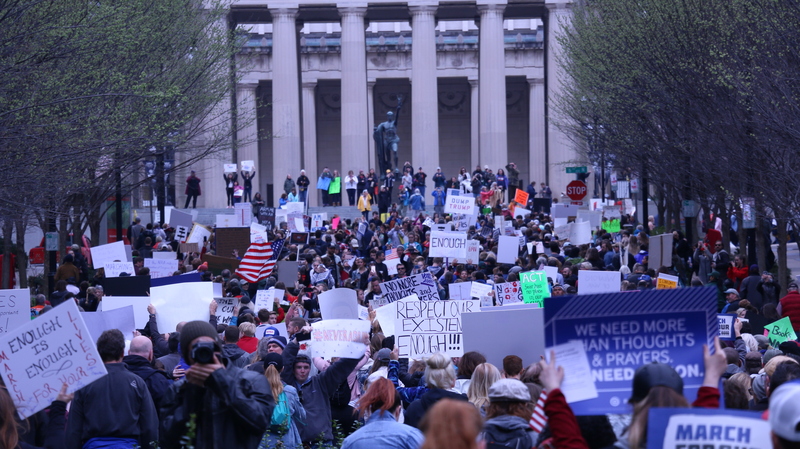 Regardless of ones stance on the issue of gun control, it is undoubtedly noticeable that the American people are tired of this issue being swept under the rug, and movements like the “March for Our Lives” are a demonstrating that they are ready for change. Personally, I’m an owner of a firearm for self-defense purposes, and although I don’t consider myself a “gun totin’ Republican” I find myself falling in the moderate area of debate on the topic of gun control. I think gun violence is an incredibly important issue that needs to be addressed by a change in gun laws. However, I think that there is a strong misconception about rifles and semi-automatic weapons that have lead a lot of people to believe that these weapons should be outlawed, which I personally do not agree with. There needs to be some sort of correlation between mental health records and firearm dealers. Clearly, there’s an issue of people obtaining guns legally and committing crimes with them, but it doesn’t mean all “big guns” need to be outlawed. 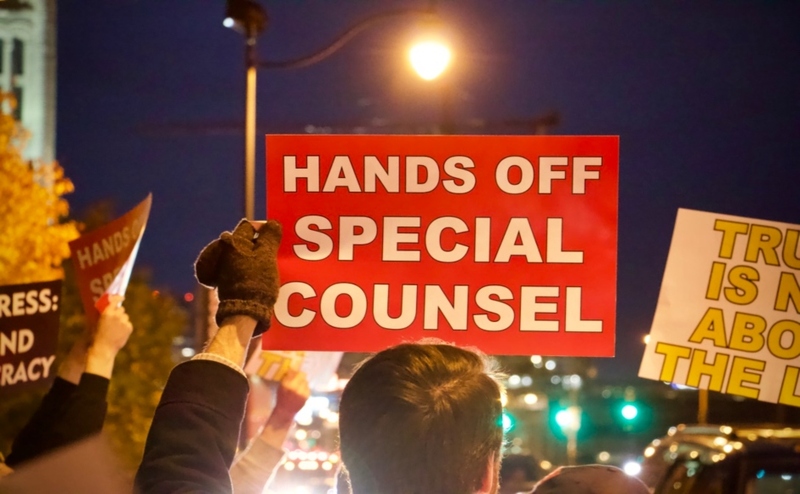 Overall, I strongly support the “March for Our Lives” movement and agree that some laws need to be changed, but I do think that the people involved need to refine their goals and ultimately be willing to compromise for the sake of obtaining timely and adequate change in the laws.